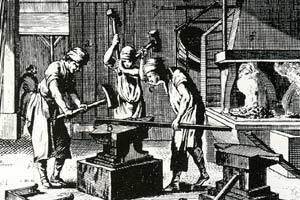 This course is designed for someone who is seeking some serious hammer time of the blacksmith's craft. The course will be structured around several sound fundamentals of practicing the blacksmith's craft; forging steel. Starting with a few buckets of horse shoes, we will dive into the process of transforming this wonderful and renewable material into the stock needed to work through the rest of the course. Bending, forge welding, stock size and shaping will be our primary goals; with that material in hand we will move into various exercises to promote hammer control, hammer swing technique and forging efficiently. In addition to several standard exercises we will delve into the world of joinery and tool making with some simple explorations of forging tongs and simple joinery tools. There maybe time for personal exploration as well. You will leave this course with a sore arm, tired hands and an enlightened perspective on what it means to be a blacksmith and how the mentality of forging steel is the foundation of the craft. If you want a new perspective to this craft, this course will expose you to it. This class is recommended for all even if you have had a past beginners class.